Veil Woman Forced By Fatwa……. – The Tundra Tabloids……. Veil Woman Forced By Fatwa……. The initial report of the Muslim teacher suspended in a British school for wearing her veil in class, in which she claimed it was out of personal beliefs, has now been proven to have been false. She was forced to wear it by a “Fatwa” issued by her Imam, “Mufti Yusuf Sacha, a Muslim cleric in West Yorkshire”. I had been told earlier that many Muslim girls in Britian are wearing the niqab as a sort of social statement, bucking the trend as it were, but now I don’t find the argument as convincing as before. I believe what is more closer to the truth, is the messages coming from the local Mosques to the Muslim youth in the West. Previous Post Previous Post Hirsi Ali……..
Next Post Next Post Pali Terrorists Use Women And Children as Shields……. 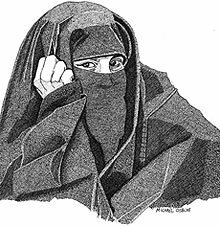 I wonder, have you asked any Muslim women about why they do or don’t cover their hair or (and in far tinier numbers) their face? Are you then ‘down playing’ the influential role of the Imam and neighborhood Mosque? They are the ones who set the tone for the rest of the community, and it’s they who are having a difficult time defending “moderation” to the Islamists, who use the Quranic scriptures rather convincingly.